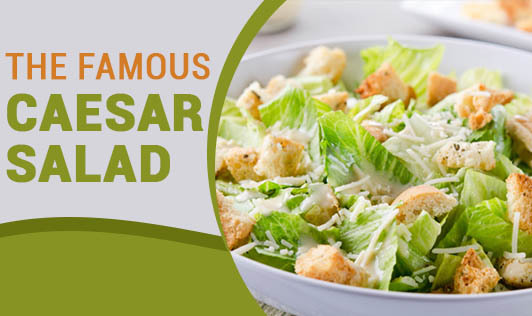 The Caesar salad is one of the most popular salads served at restaurants. It is simple, tasty and has an interesting mix of healthy ingredients. It is said that it was prepared for the first time by a Mexican chef working in Tijuana in the 1920s. Mix all the above ingredients and grate cheese as topping. 2. Peas/green gram sprouts can be added. 3. Coriander/mint leaves can be added. 4. Vegetables like capsicum, tomato, carrots, red /yellow capsicum can be added. The Caesar salad can be eaten before a main meal as it will fill your stomach and you would end up eating less food through the meal, and hence, cut down on your calorie intake. Do not try this as a meal substitute unless it is advised by your nutritionist. Send us your favorite salad recipe and we will modify it to help you lose weight. On the homepage, go to tools and choose the recipe makeover. You will see how your favorite recipe can be transformed into something healthy!